International Science Community Association journals are freely accessible and there will be no subscription contribution. We are offering open access to everyone for all journals published by International Science Community Association, to attract more viewers. 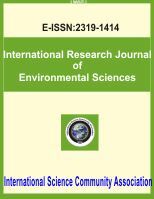 International Science Community Association journals are aimed to share the knowledge and useful research outputs for International utilization. In order to save the cost of printing and publishing, International Science Community Association journals are available in online mode only. So, no hardcopies were provided. However, we are offering free downloading and printing of International Science Community Association published journals, for your perusal purpose. International Sciences Community Association publishes all its journals in full open access format which are easily accessible for scientific community. Open access contribution in the name of "International Science Community Association" by Electronic Transfer / Draft / Cheque / NEFT / RTGS / Net Banking / Wire Transfer / Electronic Transfer / SWIFT.